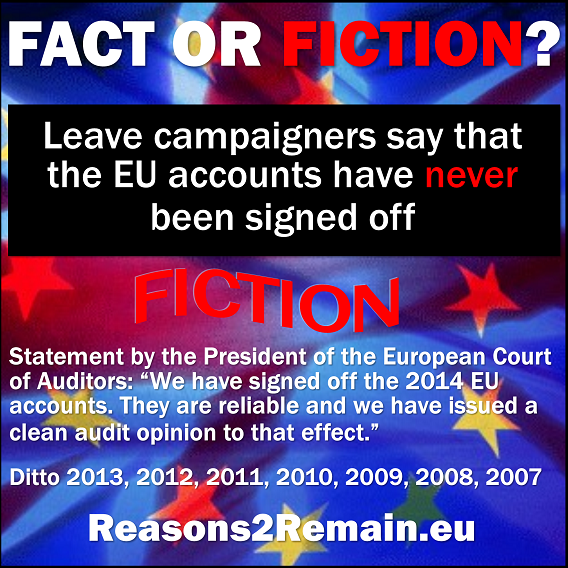 Brexit campaigners and some of the British media often claim that the EU accounts have never been signed off by the auditors. But it isn't true. "We have signed off the 2014 EU accounts. They are reliable and we have issued a clean audit opinion to that effect." All the EU accounts going back to 2007 were signed off each year by the independent auditors as legal, regular and reliable (i.e. accurate). This is confirmed in a fact sheet published by the auditors. (Before 2007 a different method of accounts was used - see note at the end of this article*). These errors were specifically made by the receivers of EU funds, in EU member states at national government level, rather than in Brussels. Since 2006, EU budgets have suffered from an annual ‘error rate’ ranging from 3.3% to 7.3%. Anything above 2% is categorised as ‘material error’. The Auditors, however, commended the European Commission for making strenuous efforts in trying to reduce the error rate to 2% or below. As the European Court of Auditors points out, the blame for the errors in expenditure ultimately lies with those who made incorrect claims for EU funding. Although, of course, better controls by member states and the EU should prevent those errors happening in the first place. The auditors found that the one area of EU expenditure not affected by material error was the EU’s spending on its own administration. This actually shows that the European Commission has a tight control on its internal finances. Errors in expenditure are, of course, unacceptable. However, all governments across the world have a percentage of error in their accounts. US government accounts, for example, have had error rates higher than 5%. The UK government accounts also had a worse error rate than the EU. The EU's goal is to reduce its error rate to 2% or less. The problems occur when the money leaves Brussels for spending by member states – and that’s actually how 94% of all EU money is used, in EU countries on policies and programmes for the benefit of EU citizens. National governments have primary responsibility for managing and controlling most EU money. That’s why Mr Caldeira called on all EU member states – which includes the UK government of course – to play their part in helping to prevent errors. The European Commission state that often these errors are detected first by their own internal audits, something which the Court of Auditors has acknowledged. The Commission said that they make arduous efforts to 'claw back' undue payments from the projects or countries at fault. This can then bring the average 'error rate' to below 2%. As for fraud, this affects an estimated 0.2% of the EU budget – modest by international standards, and much better than many British government department budgets. Whenever fraud is suspected, this is passed to the EU anti-fraud office, OLAF, for investigation. In the UK government accounts, fraud and error losses are equivalent to more than five per cent of government receipts, costing the British government more than £30 billion of losses each year. This is worse than the recent EU accounts. For example, according to the National Audit Office, Housing Benefit fraud and error in Britain was 5.8%. The EU's audit processes have been described as more robust than those of the UK Government. Former Comptroller and Auditor General, Sir John Bourn, stated that if the European Court of Auditors standards had applied to the British government’s accounts, he could not have signed off those accounts in total, because he had to give an adverse opinion on 13 of the UK government’s budgets. The total EU budget in 2014 was €142.5 billion and the error rate was 4.4%. So does that mean €6 billion (4.4%) of EU money was wasted? No, as the auditors point out, that is far too simplistic. The funds will have been used and spent on specific projects, often of benefit to EU communities, but not strictly in accordance with EU rules or conditions. 'Some of the errors involve payments which did not meet eligibility conditions: for example, support given for research by a company classified as ‘small or medium’, even though it was wholly owned by a large company. 'Some involve breaches of procurement rules, such as awarding an additional construction contract for an airport directly to a company, without giving other potential tenderers a chance to make their bids at the best possible price. The British media have often been at fault for perpetuating the myth that the EU accounts have never been signed off. However, the European Court of Auditors wrote to me to state that the Telegraph story was incorrect. The error rate did not affect the entire budget - as indicated by the Telegraph report - but only by the percentage of 'error rate' (in 2013, 4.7% of the budget, not 100%). Added the Court spokesman, "It is a frequent misunderstanding that the ECA did not approve or sign off the EU accounts." In November 2014 BBC Radio 4 'Today' presenter, John Humphrys, in an interview with EU Commission spokesman, Jakub Adamowicz, incorrectly asserted that the EU accounts had never been signed off. Mr Humphrys said to Mr Adamowicz, "you’ve never yet been able to balance your books in the European Union and the Commission" and that the auditors, "haven’t signed off the accounts have they? That’s the point, they didn’t do it last year, they didn’t do it the year before, they didn’t do it the year before; I mean they don’t do it!" (See my report, 'BBC’s John Humphrys got it wrong about Europe'). “The statement that the EU accounts have not been signed off by auditors for X years is a myth – one which we have exposed many times. • The independent European Court of Auditors have signed off the European Commission accounts every year since 2007. • The Auditors reported that the Commission’s accounts were accurate, legal, regular and reliable. • The Auditors criticised the error rate of 4.4% of the EU's 2014 expenditure. But this 'error rate' is not fraud; it relates to expenditure not strictly applied according to EU regulations. The errors took place at national level by EU member states rather than in Brussels. The goal of the EU is to have an error rate of no more than 2%. • The EU states that it 'claws back' undue payments from the project or country at fault. This can bring the average error rate to below 2%. • The EU budget has to be democratically approved by the European Parliament and agreed by the European Council, which comprises the democratically elected heads of member states.